Nellie's Needles: Here I am! It was in the early 1950's that I first held a needle in my hand. Those first experiences were embroidering stamped dish towels. I also learned to crochet at a young age. At various times throughout my life there have been periods of crocheting and knitting. In the 70's I did a lot of macrame ... including large commissioned hangings. Then there was an intense period of making bobbin lace about 20 years ago. That was preceded by tatting, and needle lace making techniques. 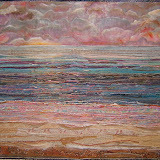 Meanwhile there was always embroidery, cross stitch, crewel and canvas work. 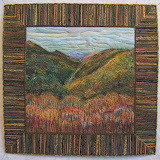 Many techniques were learned or experimented with during my long membership in the Embroiderer's Guild of America. As for sewing, I learned on a treadle machine in the late 1950's. My first projects were doll clothes for my younger sister. Shortly after that I began making my own clothes using purchased patterns as guides for coming up with unique garments. It was seventh heaven when I married a man whose mother owned a shop that carried imported fabrics. I took tailoring classes and made suits and coats and ball gowns for myself as well as sport jackets and neckties for my husband. I sewed clothing for our boys when they were young. Years later I made quite a few garments and items with French sewing techniques by hand and machine. 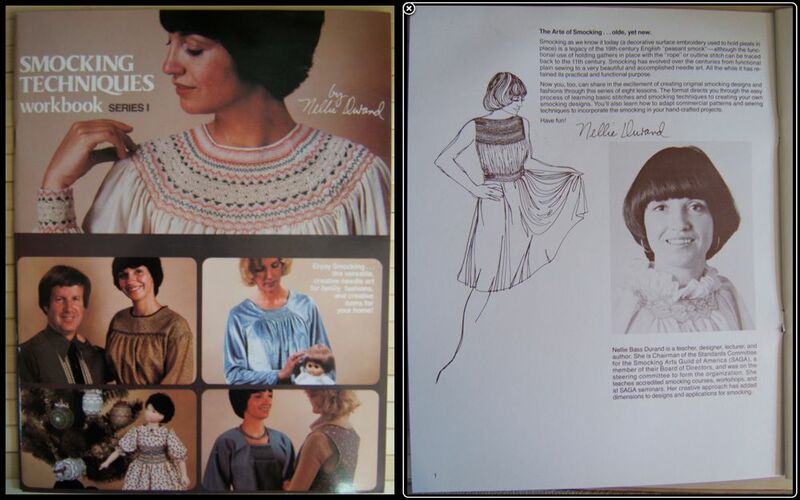 During my "prime time" years (mid 70's through the 80's), English smocking dominated my life. 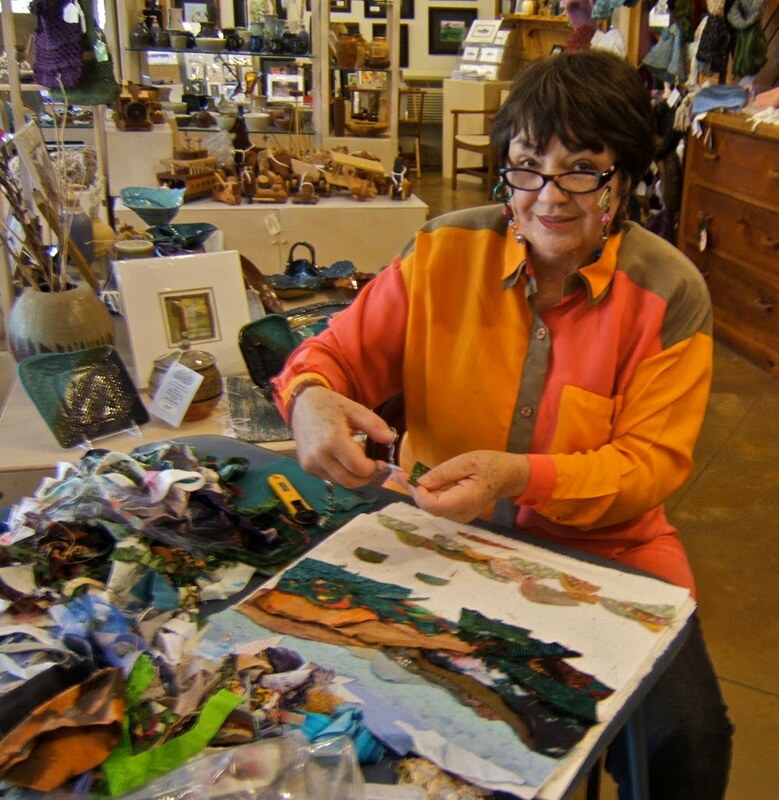 I taught the technique in 6-week long classes locally and workshops for guilds and needlework shops nationally, including Canada. The last five years of that period was devoted to teaching color and design rather than technique. 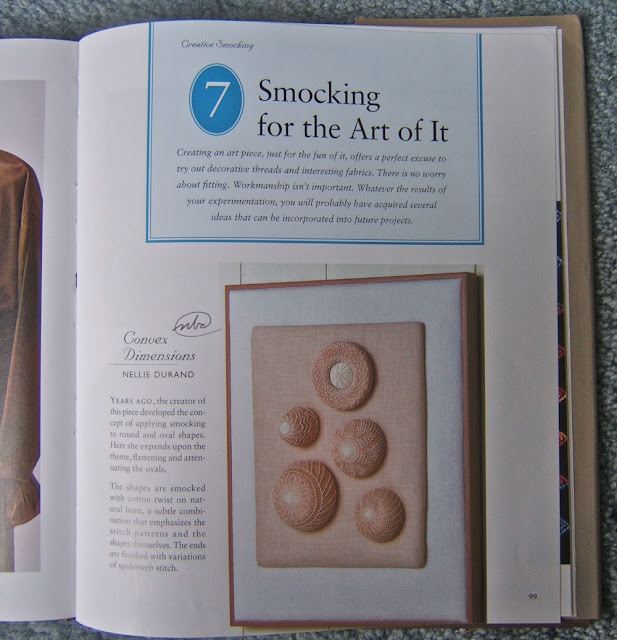 I also wrote booklets and designed kits and patterns for smocking. My work was published in magazines and books as well. 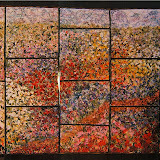 Near the end of that period I used the technique to make art pieces. 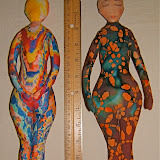 As my 50th birthday approached in early 1990's, I felt restless and a bit panicky about whether or not I was an artist. If I were, it was time to be serious about it. 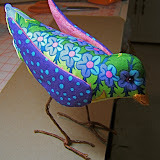 I retired from teaching and producing designs, patterns, kits, and booklets. It took a year to clear my calendar. Then my husband was retired early, his mother needed help due to health issues, and we relocated from Wisconsin to Tennessee. A couple of years later I finally had my present studio set up to get going again. 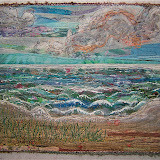 Initially, my intention was to make fiber art that incorporated various needlework techniques and textile manipulations that I had learned over many years. I stumbled into quilting because my mother-in-law gave me a box of silk fabric samples. What else could be done with all those luscious little squares? That piece went together okay, though I used boxes of straight pins to keep opposing seams aligned. Now, I could stitch those seams without using one pin. 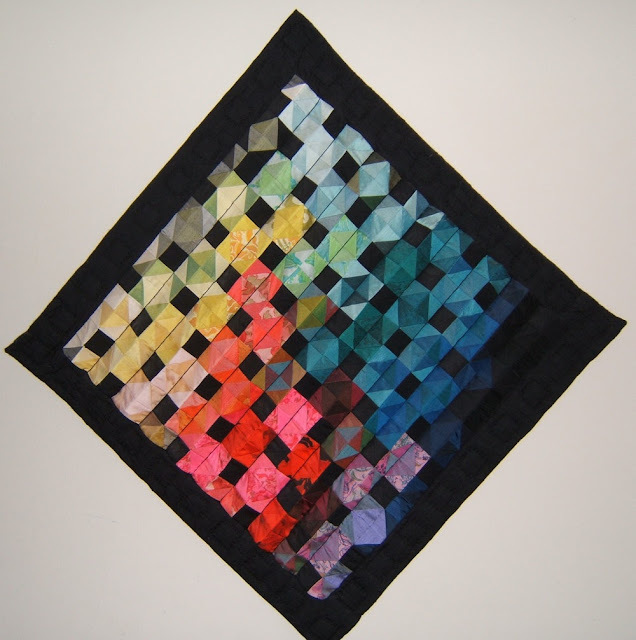 Soon after making that first quilt, I took a week long workshop with Nancy Halpern. 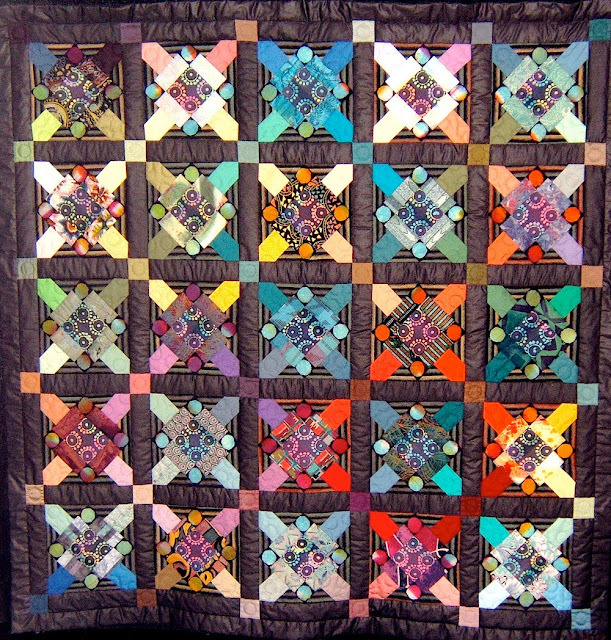 The main project I was trying to do was a pieced border with parallelogram shapes to frame one of my smocked art pieces. I consistently cut the shapes backward from what was required. This was a big problem because my stash was small fabric samples from my mother's-in-law shop. 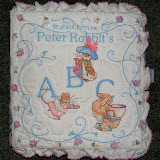 That's when I knew it was time to learn the craft of quilting. 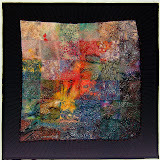 I figure it took about three years of making quilts and taking workshops as well as joining a guild to do so. 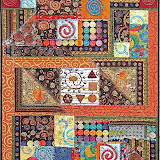 I learned a lot from the ladies I met in quilting bee groups, too. 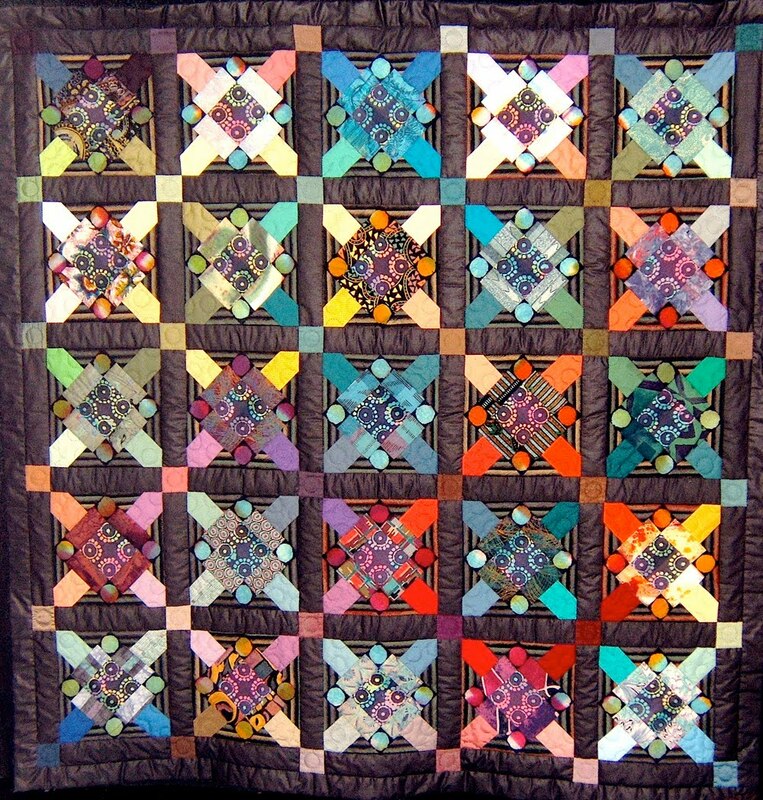 A lot of the needlework techniques that I've done and my first quilts involved sequential work on a grid. Having studied design principles and theories intensely through the years was most useful. 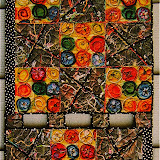 However, playing with color within geometrical designs was my major focus. Another factor, may be a natural maturation of my work. I read recently, "it takes 40 years of experience to become really good at anything." I don't remember a time when I wasn't using my hands to make "stuff". 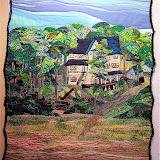 I cannot imagine my life without fabric or a needle in my hand.